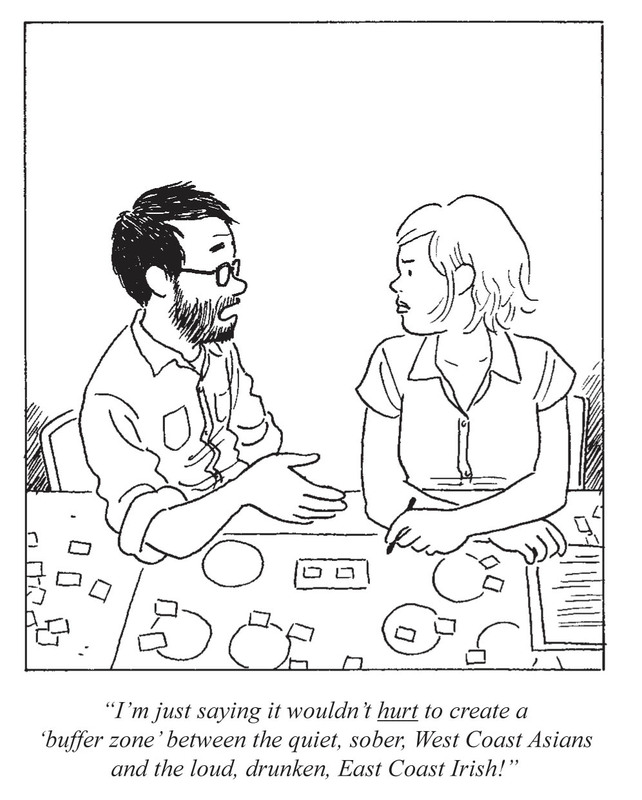 Fans of Adrian Tomine may have been wondering where he’d disappeared to. It’s been four years since the release of his penetrating graphic novel Shortcomings and, aside from his editing and design work on Drawn and Quarterly’s Yoshihiro Tatsumi collections and various magazine and album commissions, he’s been fairly quiet. 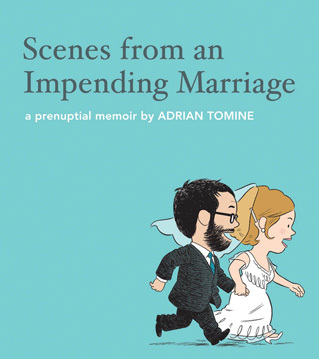 As it turns out, Tomine was negotiating such pivotal life events as marriage and children and it’s the traditionally-stressful run-up to the former that informs this utterly charming comics gem. Harking back to his beginnings in small press mini-comics, this square-bound, 56-page collection of amusing, beautifully-observed vignettes was originally intended to be a gift for his wedding guests, but with its thankfully wider release, should be required reading for any couple whose sense of humour has been progressively eroded by the throes of nuptial narcissism. With great precision and terrific good humour, Tomine expertly skewers the curious circus and the immediate, total command of one’s attention that surrounds planning a wedding. Indeed, the opening strip “Engagement” swiftly prompts a huge grin as Tomine and his new fiancee enjoy an amusingly-brief afterglow before she exclaims “Okay! So the first thing we need to pick a date, right?” and whose sudden torrent of questions is interrupted by Tomine’s half-joking offer of elopement. Tomine provides some amusing broad strokes of the experience – there a nice splash image illustrating her focused dedication to the organisational work while he lies on the sofa watching The Wire, eating crisps – as well as nicely judged expressions of the previously-unimportant niggles that crop up in every consideration (regarding the florist, the half-Japanese Tomine reflexively goes for the Japanese option while his fiancee goes for the Irish one) as the pair struggle in vain to not become “those people”. Tomine beautifully takes the teeming absurdities to task: the two-part “D.J” is particularly hilarious in its evocation of how simple tasks like choosing music become unnecessarily-complicated when the process is formalised (“Well, what I do is get a sense of the vibe and then pick the right song for the moment…”). Yet, any cynicism is leavened by a beguiling sweetness, particularly in the climactic “Honeymoon Suite” and “After Hours”, where the newlyweds big day ends in a wonderfully natural and low-key manner that defies the best-laid plans. As ever, Tomine’s black and white artwork showcases his ability to capture considerable emotional nuance in deceptively-simple fashion and this greatly amusing short outing is a reminder of the humour that peppered the earliest Optic Nerve material before he developed in to a valued chronicler of modern disconnectedness. It’ll be good to see more of this in his future work. For the married, this little treat will surely provide the odd wincing flashback with a knowing smile and for the yet-to-be-betrothed, it’ll reaffirm your committment to never be “those people” until, inevitably, you are.